Rhubarb is probably the easiest edible plant you can grow. Tucked away in the corner of your garden, rhubarb plants will produce a crop year after year with minimal attention. They produce large tuberous roots which go deep into the ground. The plant dies down to the ground in the autumn. In early spring fleshy red stems emerge from the crown each bearing a single very large leaf. The thick fleshy red skinned stems can be harvested from spring through to early summer. They can also be “forced” by putting a cover over them as they emerge so that they grow in the dark. Forced rhubarb has more tender white flesh. Rhubarb is ready for harvesting for use in pies and desserts before any of the summer fruit. We supply rhubarb in the form of crowns. These are pieces of divided tuberous roots which when planted produce shoots and develop into new plants. 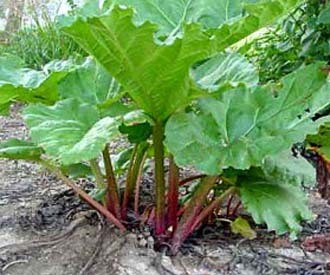 Rhubarb plants are very easy to grow and require very little attention. They do best in moist soils with plenty of organic matter. The large leaves shade out many of the weeds around them. The leaves are also not attacked by the usual pests such as slugs because of their toxicity. 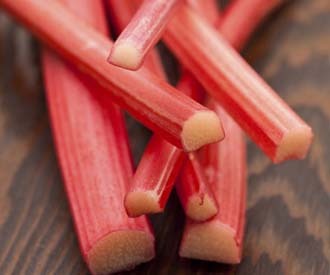 Click here for a guide to choosing rhubarb crowns. A very early rhubarb with fine pink stalks, good colour and flavour. Excellent for forcing. The most popular and widely grown rhubarb. Heavy cropper and easy to grow.